2019 Trend Watch focuses on mixing home decorating styles. And what does that look like you may ask? Mixing home decorating styles is certainly on trend for 2019 and has been for quite some time. When no longer buying “sets” of anything, mixing textiles, wood tones and textures began to emerge. Granted, it’s a bit trickier to mix up decorating styles without it looking out of scale or proportion, but gone are the days of a one-note decorating style. And when it comes to mixing home decorating styles there are a few ways to go about it. Such as mixing in an antique or vintage piece to an otherwise traditional/modern room. 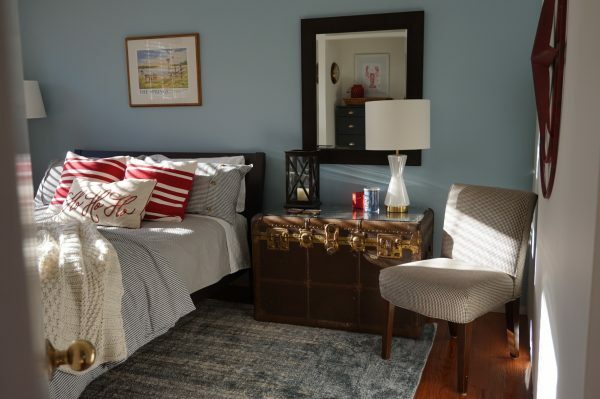 The bedroom below has a balanced mix of modern elements such as the area rug, lamp & bed frame & a traditional style Parsons Chair plus Classic Farmhouse Style ticking stripe bedding. But add in the vintage trunk and the room has an immediate sense of history. DIY Vintage Trunk, Design by Intentional Designs, Inc.
Then again, the elements in this room really set the room design apart. 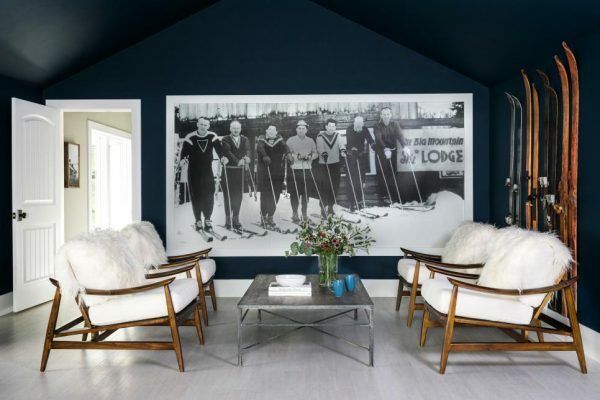 Notice each carefully selected element; an unexpected paint color & wall treatment together with Mid-Century Modern chairs, vintage ski sets as art, an industrial cocktail table atop modern gray flooring. So next time you are looking to spruce up your room find your inspiration with pieces that really resonate with you. I found mine with the vintage trunk, which has been in my husbands family so it’s special to us. But before the trunk was added to the room it lacked personality. This one piece gave the bedroom interest. And because of the size, scale, and color of the trunk, it compliments the space perfectly. Be sure to stop in at our Home Decor Shopping Site @ IntentionalDesigns.com and see What’s New Today! 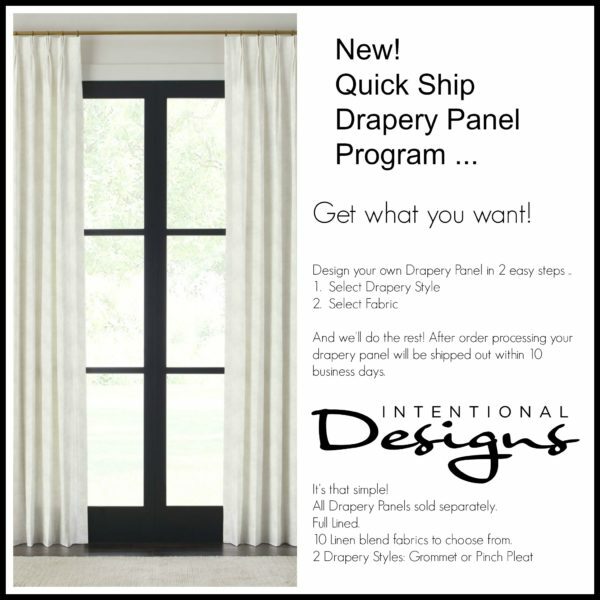 Hi, I'm Nancy Brandin Wildermuth, Owner and Founder of Intentional Designs, Inc.
Design in some shape or form has been my passion. Turning that passion into career continues to be a rewarding journey for me. I hope you enjoy my blog, I'm inspired everyday! First-time purchase? Save 50% off One Full Priced Item! Home Decor & Table Top Products Shop Today! Our custom products are made especially for you, so please allow 4-6 weeks for delivery, thanks! A sophisticated yet casual drapery heading. Clean and Modern design adding a fresh update to any space. Ease of installation, just slide grommet over maximum 1 3/8″ rod. A relaxed effortless window treatment that packs plenty of style. A simple way to add high impact. Our design does not have a top header keeping things updated + fresh.